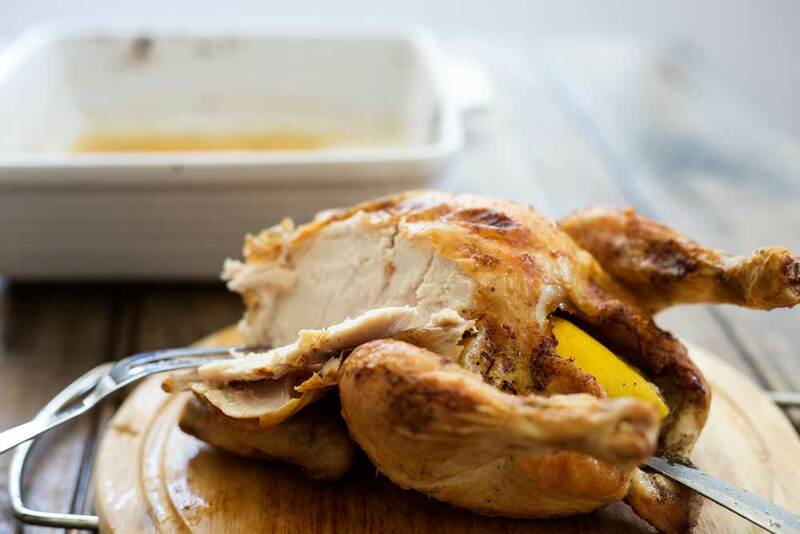 This quick roast chicken recipe is perfect for midweek when you all need a home cooking boost. It roasts in just 45 minutes and is super succulent and juicy! When I was a kid roast chicken was something we ate on a Sunday, not every Sunday as there was sometimes beef, lamb or pork (with crackling – unless my Dad got there first whilst carving!) But roast chicken, sage and onion stuffing and yorkshire puddings was a regular Sunday lunch. And we never ate roast chicken on any other day. But now I have a family and I get to choose our meals, roast chicken has moved. It is no longer a Sunday lunch dish. I will cook a quick roast chicken up mid-week, serve it with salad and fresh bread, because I am not really a fan of roast dinner! I know, call me strange, but it is just not my favourite 😉 . Once we are done, I strip the remaining meat off to use for lunches or dinner the next day, then I shove the bones in the freezer until I have a nice stash for a big batch of bone broth. In fact we love it so much that I often buy two chooks, roast them both up together. Serve one for dinner and then save the second for pulling apart. If you have the oven on for one chicken then as long as you have a roasting dish big enough why not roast two! This is not only great for planning ahead it can also work out cheaper. Our local butcher often has a deal on chickens. Buy one free range chicken for $14 or two for $20. Madness not to get two! Now I know I could put one in the freezer but honestly they take up a lot of space and then take forever to defrost! 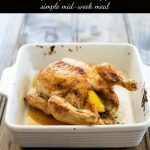 The best thing about this dish is that you can have roast chicken, which is the quintessential home cooking, ready and on the table in under an hour! Not only is my method pretty quick, it gives you juicy meat and crisp salty skin. I have been thinking about sharing this recipe for a while, but then I got an email last week that made me decide I really did need to share. October 16th is World Food Day. A day that actions change to eradicate hunger from the world. I hate wasting food. I have bags of brown bananas in the freezer (even one or two half eaten ones, where the boys have left some!) so I can make a banana bread when I have enough. If I cut the crusts from bread then I save those. My list of food saving goes on and on. 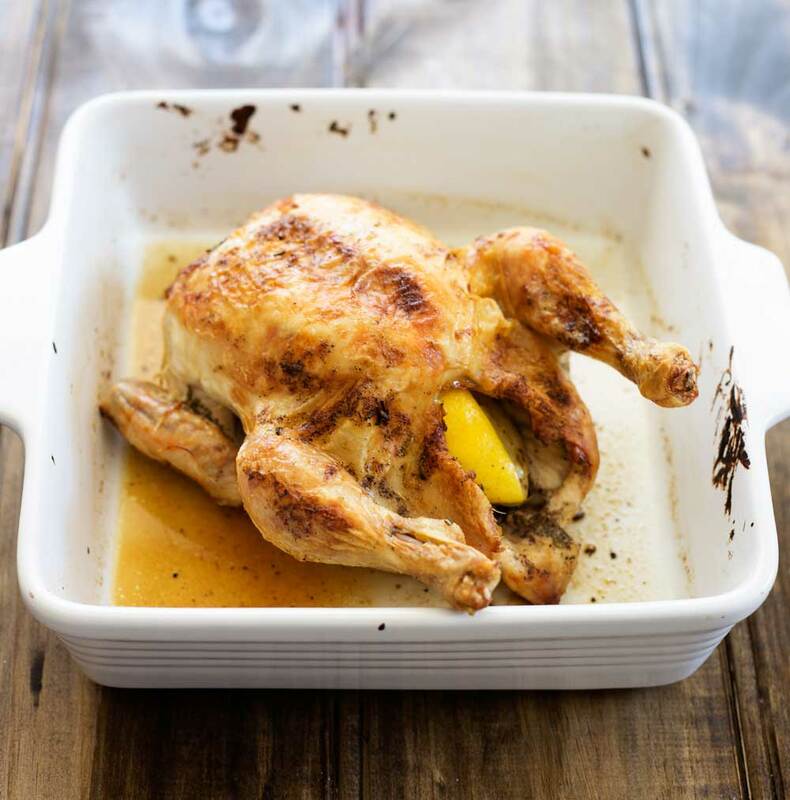 So I thought I can share my chicken recipe, share a few ways to use up the left overs and show that when you cook a meal there are so many things you can do with the food rather than throw it in the trash! And not only that, because I really believe that we should all be eating great food, making the most of what we have and throwing out as little as possible I am creating a page dedicated to ‘Leftovers’. 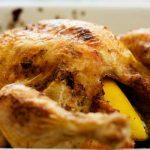 It is starting with the roast chicken from today, and I have collated a few ways to use the leftovers. I believe that leftovers don’t have to taste like leftovers, that we can save time and money by buying and cooking in larger quantities. 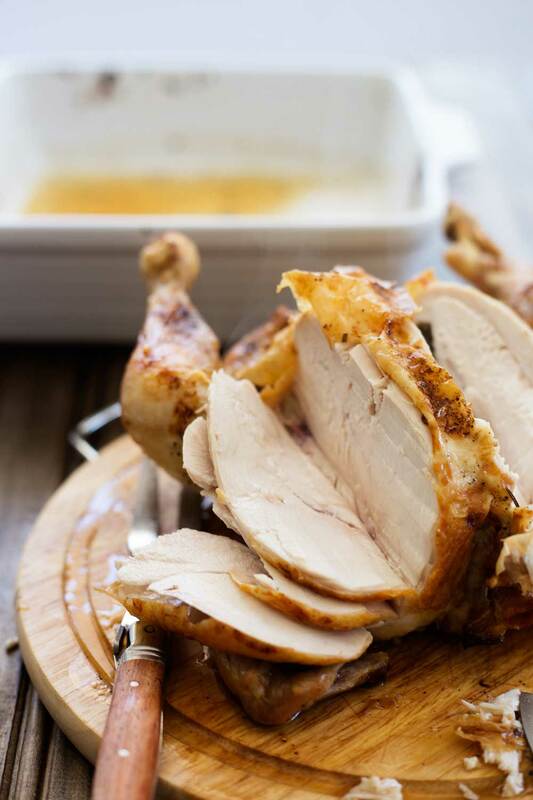 If you love this recipe for quick roast chicken why not subscribe to my newsletter, then you can have delicious recipes straight into your inbox. What is more as a thank you I will send you my soup ebook for FREE! 45 minute roast chicken. The ultimate comfort food and on the table in under an hour. Crispy skin, succulent meat and simple to make. Remove the chicken from the fridge for an hour before cooking. Remove any trussing or string so the chicken is sitting freely. Finely chop the rosemary, then peel and finely chop (or crush) the garlic. Add these to a bowl along with the butter, add the salt and black pepper and mix well with a fork. .
Spoon the butter mixture into the cavity of the chicken, don't worry about scraping the bowl, you will use the leftovers in a moment. 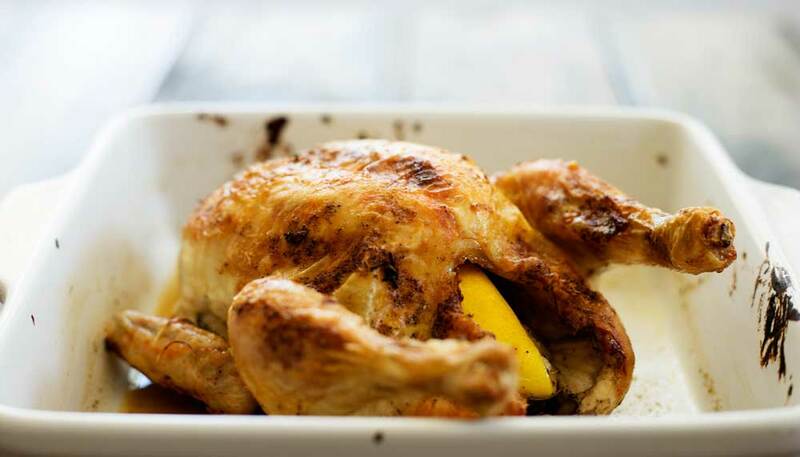 Place the chicken into a roasting tin and use your fingers to gently massage over the remnants of the butter mixture. Season the top with a little extra salt and then place in the middle of the oven for 45 minutes. It is important not to open the door during the cooking time. Set your timer and don't touch. Transfer the chicken to a chopping board and leave it in a warm place to rest for 10 minutes. Absolutely a simple recipe to begin with. Just a few ingredients and we are good to go! So happy you enjoyed it Martin. hey nice picture up there it make me want to eat roast chicken.